Sock of Ages The Wonderful World of Sock Monkeys! If people aren’t familiar with lesser-known Broadway musicals, they usually think you’re talking about something risque if you mention the show Once Upon a Mattress. That’s too bad, because it’s a funny, family-friendly show that earned a young Carol Burnett a TONY award nomination for best actress when it premiered in 1959. An adaptation of the classic fairy tale The Princess and the Pea, the musical has attracted a large amount of star power over its 50+ years for various Broadway, national tour and television versions, including Buster Keaton, Ken Berry, Sarah Jessica Parker, Elliot Gould, Imogene Coca, Bernadette Peters, Wally Cox, Jack Gilford, Dody Goodman, Matthew Morrison, Jane Krakowski, Zooey Deschanel and Tracey Ullman. Of course, this is an ideal show for high school theatre productions as you can put as many kids in the chorus as you like, the set isn’t too complicated, the dance numbers are comical and the music isn’t too difficult to sing. So this fall when my step-daughter Jessica was cast in her high school’s version of the show, we were proud and excited for her. And you can imagine one of the first places my brain went – sock monkey! Jessica was to play Lady Mabelle, one of Lady Larken’s maids in waiting. She’s French and pretty much only ever says “yes”, but I think that any time a character you play has a name and you’re not just listed as “ensemble”, it’s a big deal. Jessica’s drama department doesn’t have much of a budget, so the kids had to supply their own costumes, which they ordered online. I only had a black and white photo to work with, so I found out from her mom that the dress was made of deep blue and black velvet with gold trim. I had never sewn with velvet before and it sucked! Later on my costume shop friends were all saying “Oh, you should have basted it together before sewing it,” but of course, they didn’t give me that tip until I had fought and cursed my way through the project. Jessica has tons of beautiful, wavy brunette hair, and she looked quite beautiful in her costume. 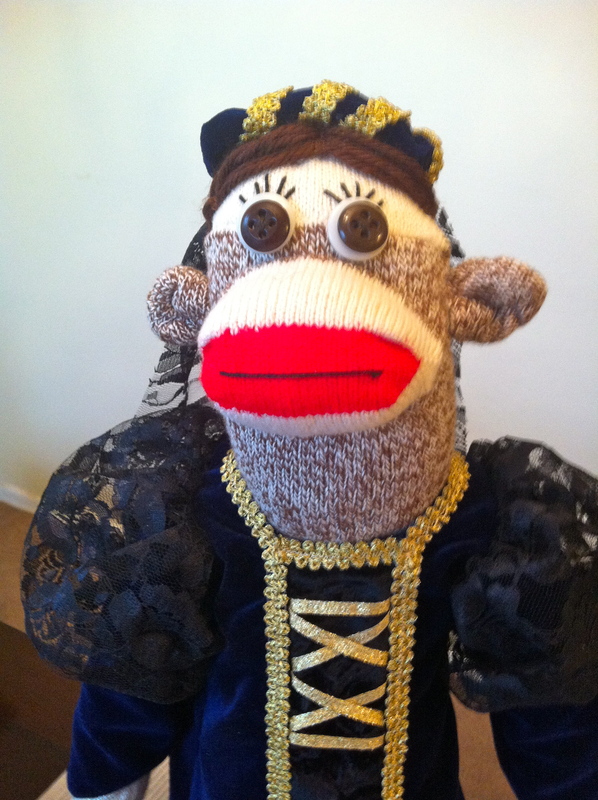 Although it’s difficult to capture beauty in a sock monkey, I tried my best with giving her big brown eyes (vintage buttons from Aunt Fofo’s button box) and some flirty eyelashes. As she is a lady, she wears satin petti-pants trimmed in lace, and I did my best to make her yarn wig look something like the style she wore her hair in for the show. 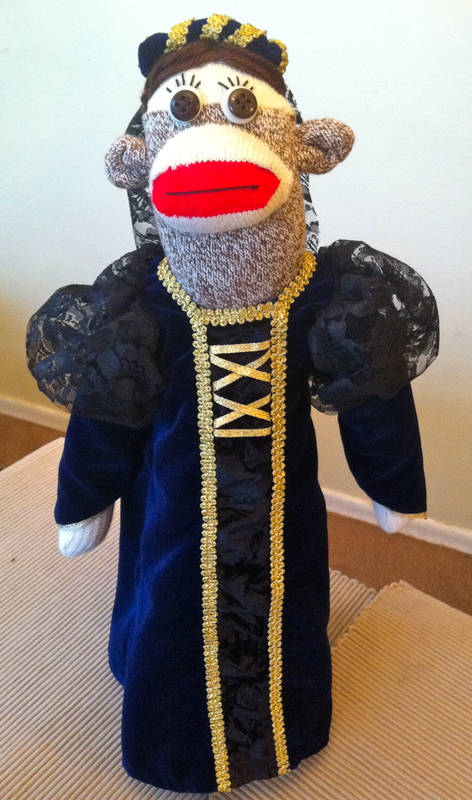 The sock monkey version is really sweet, and I loved sending off and surprising her with it. I have hopes that Jessica will continue her interest in theatre and maybe even pursue a career in it. I just hope she doesn’t have to sew much with velvet.